Philip Rivers in the team’s Week 2 loss at Cincinnati. Courtesy of San Diego Chargers Twitter. It was a back and forth battle but the Chargers couldn’t quite finish the comeback in a 34-41 loss to the Oakland Raiders in San Diego Sunday. The loss drops the Bolts to 1-4 overall and keeps them winless on the road. The first half didn’t have a ton of scoring; San Diego had a touchdown and a field goal to lead 10-9, with all of Oakland’s points coming by way of field goals. The offense exploded for both teams in the third quarter, and at the end of it, the Raiders led 27-24, both teams scoring two touchdowns and another Oakland field goal to get there. In the fourth, Amari Cooper would score to push the Raiders’ lead to 10 points at 34-24. The Chargers would answer back with an Antonio Gates TD, but it wouldn’t be enough as they’d fall short three points. 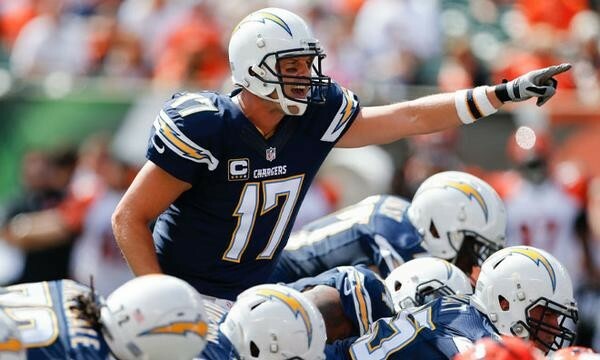 Quarterback Phillip Rivers still had a productive game; despite two interceptions, he’d throw for four touchdowns and 359 yards on 21-30 passing. The Chargers have a short turnaround for next week as they take on the Broncos for Thursday Night Football.